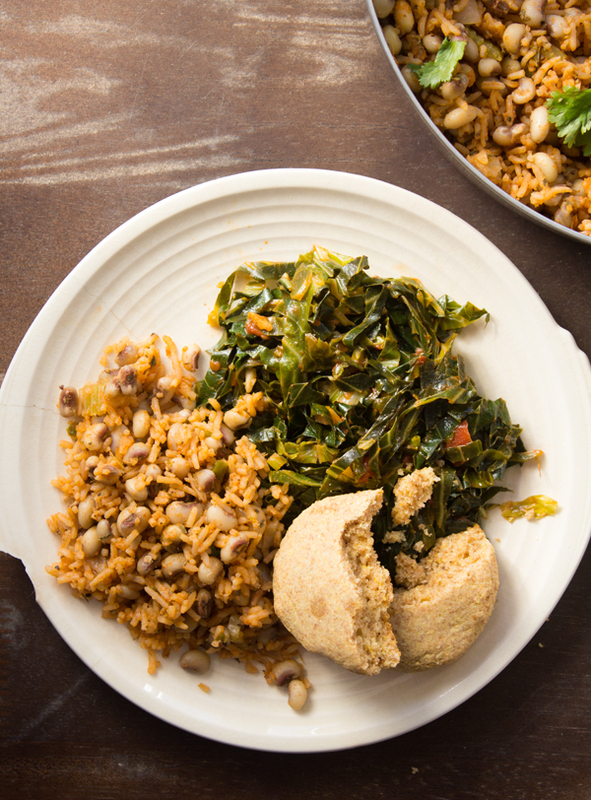 Vegan Hoppin’ John is one of my favorite simple Southern meals. For my version I use home-cooked black-eyed peas, long grain rice, and smoked paprika to achieve the perfect flavor and texture. This is one of those recipes that you can make once a week, and eat off of throughout the week. 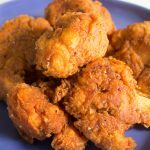 Pair it with other soul food staples like collard greens, biscuits, cornbread, or fried cauliflower “chicken” to round out its down home appeal. 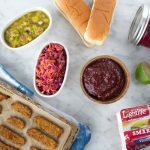 Adapting Soul food staples into plants-only versions is so fun for me, and Hoppin’ John has really been asking for it all along. While the traditional recipe uses bacon for flavoring, this is at its core a rice & beans dish, and rice & beans is a perfect plant dish. Together these two staples make up a complete protein. They’re both affordable and reliable, and easy to prepare. It’s not a coincidence that rice & beans is the centerpiece dish of cultures throughout the Americas. And one very cool thing about this particular rice & beans dish is its West African pedigree. There is some debate over the origins of rice in the Americas—while wild rice did grow here in pre-Columbian times, it was only domesticated in Africa and Asia, and it’s not clear what role different rice varieties from these different parts of the world played in establishing the crop in the Western Hemisphere. But whatever particular strain they were eating in the Southern United States, it is clear that African slaves came from culinary traditions that relied on rice. Likewise, whereas many of the types of beans that often make their way into rice and bean dishes—black beans and red beans (aka kidney beans) are common—originated in the Americas, black eyed peas come from West Africa. 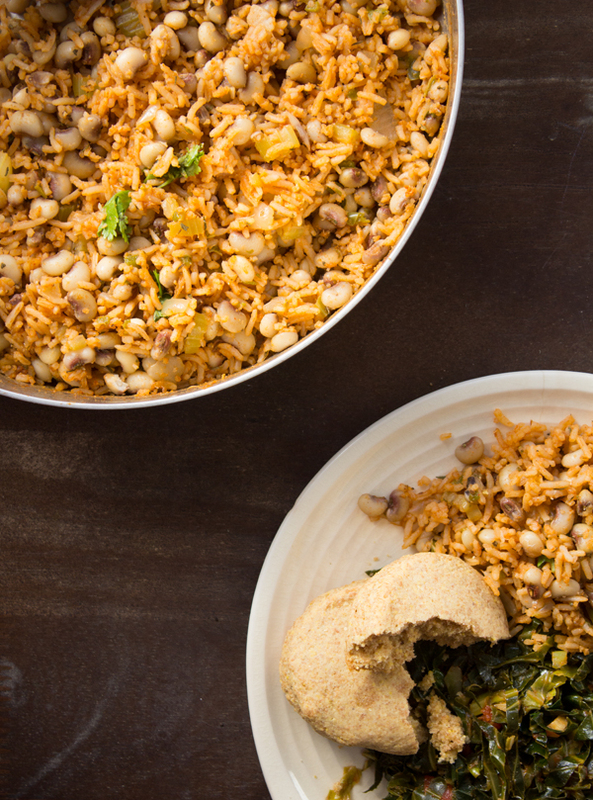 When I photographed this recipe, I thought that the Hoppin' John could use some more moisture. The recipe below is the updated recipe that is more moist and full of flavor. If you are using freshly cooked black-eyed peas drain the beans before adding, and save the cooking liquid for the recipe. Heat oil on medium-high heat in a large skillet. Once the oil is hot, add the onion, jalapeño, and celery, and sauté until the onion turns translucent, about 3 minutes. Add the garlic and brown rice, and stir well to toast for about 30 seconds. Add the bay leaf, dried thyme, black pepper, and water + veg bouillon. Stir well, cover with a lid (leaving it ajar), and bring it to a simmer. Reduce the heat to medium-low, and continue to cook the rice for 10 minutes. Add the cooked black-eyed peas, and continue to cook until the rice is tender and fluffy, about 20-25 minutes. Stir in the smoked paprika, and season to taste with salt and pepper. Serve hot with hot sauce, and chopped parsley. 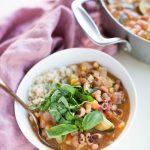 Black Eyed Pea Gumbo | Cookbook Pre-Order Bonus!